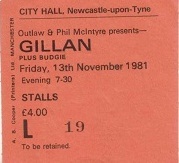 Gillan were back at Newcastle City Hall in November 1981, this time with local guitar hero Janick Gers who had joined the band as replacement for Bernie Torme. Looking back, Bernie’s departure probably was a sign that all was not well in the band, and it was perhaps inevitable that they were soon to split up. The new line up released the album Double Trouble shortly after Janick joined. Double Trouble was, as its name suggests, a double album, with one disc recorded in the studio, and the other recorded live. Janick Gers hailed form the North East, and was well know to the Newcastle rock crowd as the guitarist in local band White Spirit who had gigged consistently throughout the region in the late 70s and early 80s. Janick was a more than adequate replacement for Bernie. What was lost in terms of punk rock swagger and guitar heroics, was more than compensated for by Gers’ technical guitar wizardry and his more traditional rock star stance. The local crowd gave him a great reception that night, and the concert was as good as ever. Gers was, of course, to go on to much greater success with Iron Maiden. Support acts for this tour were rock stawlwarts Budgie, and Nightwing. Budgie has just released their ninth album Nighflight, and their line-up at the time was original member Burke Shelley – vocals, bass guitar; John Thomas – guitar; and Steve Williams – drums. Budgie retained their own strong following in Newcastle, had headlined the City Hall and the Mayfair themselves in previous years, and were quite a “big” name support act. 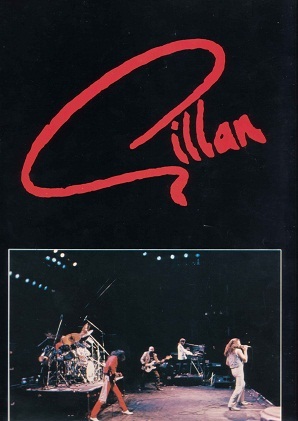 I was to see Gillan once more at the City Hall in the following year, before the band split. I’ll blog on that gig tomorrow, which will be my final Gillan post.